A big part of verd de gris’ work is about reaching out to groups of people who don’t often get the chance to share their experiences with the wider community. So as part of our Big Lottery Reaching Communities project we asked film maker Geoff Brokate to spend time with some of our local taxi drivers – drivers who represent the diverse ethnic make-up of the trade here in Calderdale. Over the course of 12 months Geoff met up with and made links with two groups of drivers working in the Upper Calder Valley. Geoff spent time on the ranks and shadowing drivers from the communities (White British and Pakistani respectively) as they went on their daily routes … eavesdropping on the stories and conversations that filled the cabs on a daily basis. Australian film maker and photographer Geoff has travelled extensively in Pakistan and South Asia where taxi drivers have a very strong culture and tradition – e.g. the highly ornamental decoration of the cabs, the status of the drivers. Geoff wanted to set this in contrast with the culture of the profession Pakistanis brought to the UK. How do lives differ? What is the status of the driver in the UK compared to back home in Pakistan? Working with drivers in private hire, Hackney cab, small scale operators across Calderdale he also wanted to explore the similarities and differences between communities of drivers in the Upper Valley. Working with the support of Counsellor Faisal Shoukat and Sail Suleman from Calderdale MBC, verd de gris arranged to meet around 10 drivers from each community … with a view to working closely with a set number of individuals. 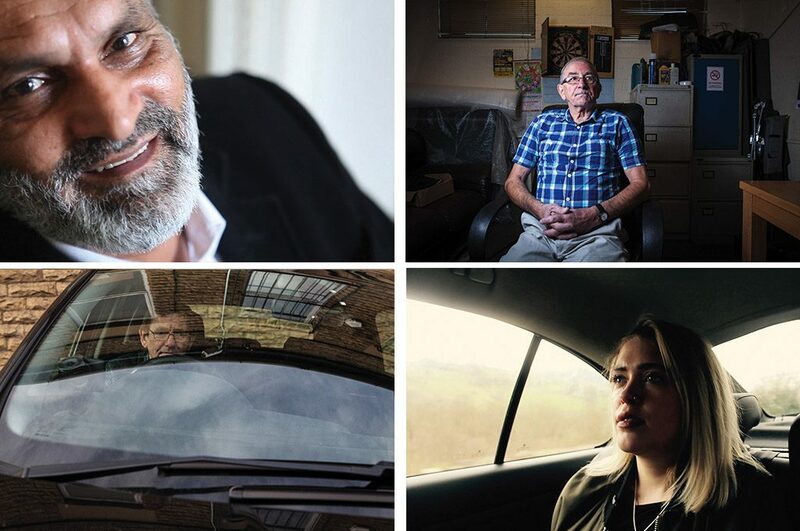 We hoped the project would give all us of in Calderdale an opportunity to know much more about the life of the taxi driver – to find out more about the culture of this high profile but little-explored profession and celebrate the work they do. The 20-minute film ‘TAXI!” is a gentle, funny and touching insight into the lives of a group of people we often take for granted. It weaves together the life-stories and experiences – both positive and negative – of drivers from the respective communities. We were also able to create an exhibition of still photographs contrasting ‘life’ on the respective bases … the solitude, ennui, camaraderie that is common to both ‘communities’. “I feel the film shows the real side to the taxi industry, it creates a story line of the changes that have taken place and how the general perception of the taxi driver community is viewed amongst the public. Taxi drivers come across the public from all walks of life, they have a rich picture to share, they engage with the public and at times can be seen to be the 4th emergency service. The film and exhibition have been toured successfully through local libraries in Calderdale. The film has also been used by CMBC Cohesion & Equality Officer at a national conference on hate crime in Birmingham in November 2016.